Shares of Camarillo-based chipmaker Semtech Corp. were up 4.8 percent after the company announced stronger-than-expected sales and profits. 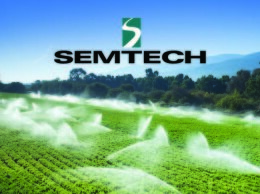 Semtech, which uses a fiscal year that ends in January each year, said Aug. 20 that its second-quarter fiscal 2015 revenues were $145.7 million, up 10 percent from the previous quarter but down 12 percent from the same period last fiscal year. Excluding one-time expenses, second-quarter profits were $28.3 million, or 42 cents per share, up from 32 cents in the previous quarter but down from 52 cents a year earlier. Wall Street was expecting profits of 39 cents a share on revenue of $141.95 million. In a statement, CEO Mohan Maheswaran said “the insatiable demand for bandwidth at lower power” in LTE base stations for mobile phone data services drove much of the growth. Semtech is navigating a rocky patch after several years of fast growth and acquisitions. In recent years, the company acquired fellow chip firm Sierra Monolithics for $180 million and Gennum Corp. for $494 million, both cash deals. But earlier this year, Semtech said it would cut 6 percent of its workforce, or roughly 86 jobs, to save up to $35 million a year in a cost-control move. Business Times records show the company has about 200 employees at its headquarters in Ventura County; it has not issued a notice to government officials of any mass layoffs in the county. Semtech predicted next-quarter revenues of $142 million to $152 million, in line with the new and lowered estimates it made with the downsizing earlier this year. Its balance sheet remained strong, with $239.2 million in cash, only a slight dip from $244.3 million the year before. Semtech shares were ended the day up 4.8 percent to $25.15 on Aug. 21.